The company most recently released Circus Atari, a circus-themed puzzle-platformer, and Centipede: Origins, in which players defend their garden from invading insects. Additionally, Zynga announced yesterday that Atari has joined as one of its early partners for its new mobile publishing program, Zynga Partners for Mobile, with one new title coming soon. Other soon to be announced partnerships will allow Atari to continue to reach the broadest possible audience with new technology and innovation based on its popular library of game franchises. “40 Giveaways in 4 Days” sweepstakes (US residents only): Starting today, fans can visit Atari on Facebook at www.facebook.com/atari for opportunities to win Atari Arcades, t-shirts and more! A special call-out to Atari fans: Post a photo of you and your friends wearing your Atari t-shirts to our Facebook wall at www.facebook.com/atari. 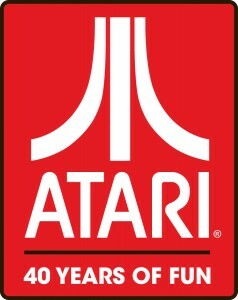 Atari (www.atari.com) is a multi-platform, global interactive entertainment and licensing company. The original innovator of video gaming, founded in 1972, Atari owns and/or manages a portfolio of more than 200 games and franchises, including world renowned brands like Asteroids®, Centipede®, Missile Command®, Pong®, Test Drive®, Backyard Sports®, Ghostbusters®, and Rollercoaster Tycoon®. Atari capitalizes on these powerful properties by delivering compelling games online (i.e. browser, Facebook® and digital download), on smartphones and tablets and other connected devices. The Company also develops and distributes interactive entertainment for video game consoles from Microsoft, Nintendo and Sony. As a licensor, Atari extends its brand and franchises into other media, merchandising and publishing categories. Atari has offices in Los Angeles, New York, Paris, Lyon and London. © 2012 Atari Interactive, Inc. All rights reserved.